← Zooming into a microchip: that’s where the (computer) magic happens! $5 per hour: that’s how much it cost in 1982 to get on the ‘Net. 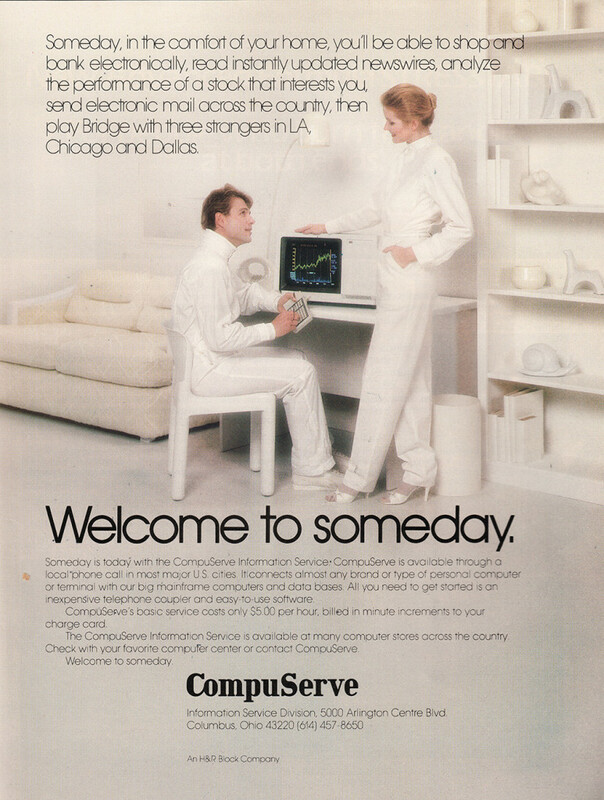 Well, actually, not Internet: just Compuserve, with its e-mail services. The original CompuServe Information Service, later rebranded as CompuServe Classic, was shut down July 1, 2009. The newer version of the service, CompuServe 2000, continues to operate. Nice to see what the future looked like in 1982: a ‘total black’ environment where some sort of wireless keyboard was connected to a desktop computer, much like an Apple Lisa with a color display showing the ubiquitous graph chart. Last but not least, it all happens in the comfort of your home. This entry was posted in Advertising, Compuserve, Digital life, Internet and tagged Communication, Compuserve, e-mail, Vintage, vintage ads, vintage advertising. Bookmark the permalink.